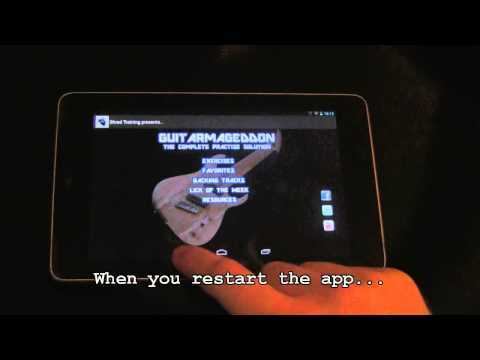 Use Guitarmageddon to warm up, learn scale/chords/arpeggios, practice licks and develop technique. Or favourite a selection of exercises/licks and create your own personalised practice routine, an amazingly powerful tool. Over 300 exercises, riffs and licks with more added every month. Technical exercises covering alternate picking, legato, sweep picking, tapping, chords, arpeggios scales. Riffs and licks in many styles of rock, metal, jazz, funk and blues. Exercises split into Beginner, Intermediate and Advanced so it is easy to work at your own pace. Favorites feature that allows you to pick any of the exercises and licks to create your ow routine. Lick of the Week - Each week a new lick will be added with a video link to YouTube. Metronome settings from 40bpm to 300bpm. Finding a lick too difficult? You can slow it right down and work it up to speed. Huge library of chords, scales and arpeggios in a logical order. Split into Beginner/Intermediate/Advanced so you learn your theory in a practical, progressive way. Play Alongs - These in app purchases contain specific technique routines, written by author of the Riff Training series Jonathan Strange. No online audio/video files within the exercises section meaning you can access all exercises and routines no matter where you are in the world. Incredibly powerful - for just $4.99 you have access to hundreds of exercises, presented in a logical order and a lifetime of updates.